Getting Your Wings! 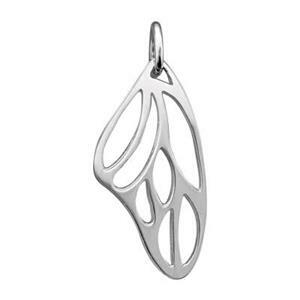 Whether you’ve just earned your pilot’s license – or passed your examinations – or gained experience in a new field – or are simply enamored with butterflies - you’ll love our SN530 – Bright Sterling Silver Butterfly Wing Outline. These come with a 3.4mm Inside Diameter Closed Jump Ring. As Sandra, says in her review, she uses them by “forming” them around sea glass! Choose from one of our many of Sterling Silver Footage Chains and watch your creations take on a metamorphosis of their own! This sterling silver butterfly wing is gorgeous - I loved handling them as I assembled them into pieces with sea glass! Being sterling, I could "form" them to fit the sea glass pieces and the earrings/necklaces turned out beautifully. I will be ordering more of them, to be sure.